Angle determines the size of an image of the object formed on the retina. As shown in the figure, the farther the object distance from the eye the smaller the angle and therefore the smaller the image size formed on the retina. The simple astronomical telescope has two convex lenses; each called the objective lens and the ocular lens. The objective lens has a greater distance from the eye while the ocular lens has a distance closer to the eye. Objective lens functions to bring the image closer to the ocular lens, so the angle becomes larger. Ocular lens function to increase the angle so that the size of the image formed on the retina is greater. Negative signs only explain the image is inverted so that it can be eliminated from the equation. When the observer’s eyes focused at the far point (accommodation is minimum) the image produced by the objective lens must be at the second focal point of the objective lens. Thus the image distance of the objective lens (diob) = the focal length of the objective lens (fob). Objects are very far away from the objective lens and are considered infinite therefore the object distance from the objective lens (doob) = infinite. Based on this equation it is concluded that the linear magnification of the objective lens is close to zero so that it can be ignored. Note that even though the linear magnification is small, the objective lens brings the real image closer to the ocular lens, so the angle between the real image and the ocular lens is larger. Ocular lenses function to increase the angle, so the equation of the magnification used is the equation of the angular magnification. The equation of the angular magnification of the ocular lens of the astronomical telescope is different from the equation of the angular magnification of the ocular lens of the microscope because the microscope is used to see objects nearby while the telescope is used to see distant objects. Mok = the angular magnification of the ocular lens, fob = the focal length of the objective lens, fok = the focal length of the ocular lens. There is no linear magnification hence the total angular magnification of the astronomical telescope when the eye focused at the far point, or the accommodation is minimum (M) = the angular magnification of the ocular lens when the eye focused at the far point, or the accommodation is minimum (Mok). Negative signs only explain the inverted image so that it can be eliminated from the equation. When the observer’s eye accommodates maximum, the image produced by the objective lens is between the first focal point of the ocular lens and the lens. 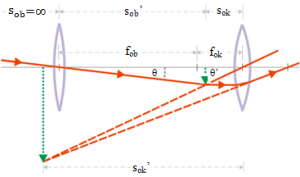 Thus the distance of the real image from the objective lens (diob) = length of the telescope (l) – the distance of the real image from the ocular lens (dook). Objects are very far away from the objective lens and are considered infinite therefore the object distance from the objective lens (doob) = infinite. Based on this equation it is concluded that the linear magnification of the objective lens is close to zero so that it can be ignored. Mok = the angular magnification of the ocular lens, sob’ = diob = the image distance from the objective lens, dook = the distance of the real image (image are considered objects) from the ocular lens. There is no linear magnification hence the total angular magnification of the astronomical telescope when the eye focused at the far point, or the accommodation is minimum (M) = The total angular magnification of the ocular lens when the eye focused at the far point, or the accommodation is minimum (Mok). M = the total angular magnification, diob = the image distance of the objective lens, dook = the distance of the real image (image is considered an object) from the ocular lens, l = the distance between the objective lens and the ocular lens = the length of the telescope.